PhoneShop DVD Review All up this is a fresh and engaging series that will appeal to fans of the aforementioned comedies, and those who like their sitcoms slightly silly and a little bit surreal. 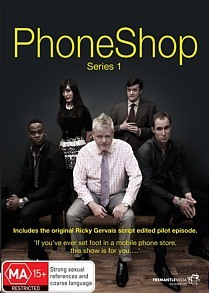 Counting such luminaries as Stephen Merchant (The Office) and Harry Enfield (Kevin and Perry Go Large) amongst its fans and with its pilot episode having been script edited by none other than Ricky Gervais, new British sitcom PhoneShop was in good hands from the get-go. Recently renewed for a third season, the show is the brainchild of producer and writer Phil Bowker, whose previous comedy credits include the series’ Pulling and the acclaimed if criminally overlooked 15 Storeys High. In the best spirit of its thematic forbears like The Office and The IT Crowd, PhoneShop gathers together a motley assortment of odd yet lovable misfits, whose frequently hilarious attempts to stave off the drudgery of the workaday world provide both a welcome respite from boredom and something approaching a sense of togetherness. The setting, as may be gathered, is a high street mobile phone emporium. Presiding over the shambolic workplace is Lance, who aside from his penchant for frequent masturbation is actually a fairly nice fellow. Ashley and Jerwayne are the sales superstars of the branch with egos to match, and delight in tormenting recent college graduate Christopher, or New Man, himself desperate to prove his worth in the high stakes world of contract mobiles. Mousy Janine has her eye on the assistant manager position recently vacated by the legendary if criminally inclined salesman Gary Patel, and Lance’s near-messianic worship of his former employee provide some of the show’s funniest moments. Another treat is Syriana’s Kayvan Novak making a thoroughly chavvy cameo as rival phone store manager Razz Prince, determined to prove that this crowd of upstarts are no match for his own finely tuned crew of salespeople extraordinaire. The end result is a quintessentially British comedy that breathes new life into a much-explored genre. The writing is solid and the majority of the performances spot-on, with Martin Treneman as Lance and Javone Prince as Jerwayne proving particular standouts. Tom Bennett’s squirrelly performance as Christopher also provides much of the show’s comedic impetus, and writer-producer-director Phil Bowker proves a dab hand at knowing exactly when to introduce a new character or sudden change of scenery in order to keep things chugging along at a nice pace. All up this is a fresh and engaging series that will appeal to fans of the aforementioned comedies, and those who like their sitcoms slightly silly and a little bit surreal.